Capturing ideas is a crucial step in the writing process. You haven’t truly adopted the “ideas-are-everywhere” mindset of a writer until you figure out a way to capture the ones that come your way. You need to find a way to remember them. Your ideas can be one of your most valuable resources because they are unique to you. A system is the solution — a way to record or organize your ideas. Writers use all kinds of different ways to capture their ideas. 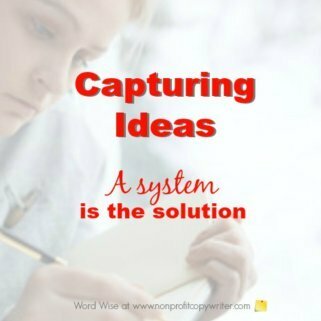 It doesn’t matter how you capture ideas. Here are few of the ways writers keep track of the ideas that come to them. Experiment with different approaches to find what works for you. If you regularly jot down thoughts in a journal, then you also know to review those notes to look for patterns or to recall an idea. You can even create a special code or use colored pens or pencils to label your ideas. And if you don’t journal yet, consider starting. A thought comes to you while you’re in the car, sitting in traffic, or whizzing down the highway. Other times you snap a picture of a news item you see while reading a magazine in the doctor’s office or record an audio message for yourself on your phone while you’re working in the kitchen — all with the intent to process the information later. Yes, there is an app for that! Use a note-taking smartphone application (Evernote or Catch All, for instance) to help you collect and organize your ideas. One advantage of having physical file folders is that you can save hard copy ideas that come your way in magazine articles (yes, tear it out), flyers, junk mail, or letters. another other piece of paper in folders labeled by topic.